Should You Store Coffee in the Fridge? How Do You Store Ground Coffee? The second coffee beans are roasted they start slowly losing their flavor! And the worst thing is we can’t really stop the process. BUT we can slow it down. And save the beans, which means saving the flavor of our favorite beverage. To do that, we just need to store the beans properly. 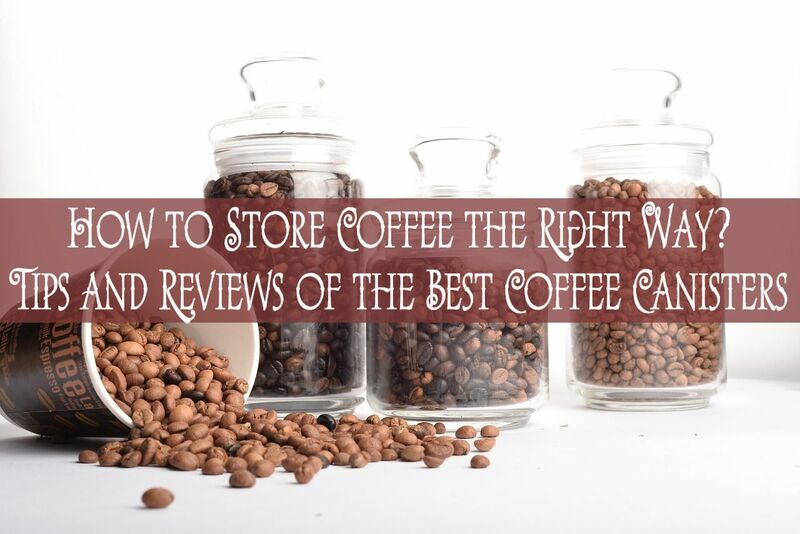 That’s why I’ve prepared some storage tips and reviews on 5 best coffee canisters for you. Let’s dive right in! Have you noticed that the majority of coffee bean packages are labeled the Best Before date and this date is within 12-24 months? Truth is, coffee beans cannot remain fresh for such a long period. In fact, freshly roasted beans have their flavor and aroma peak within the first 72 hours, and then start gradually losing those positive properties. And the more time passes, the more coffee flavor disappears. At the same time, the beans even acquire negative odors that only become more noticeable with time. Interestingly enough, green coffee beans (unroasted ones) can remain fresh for more than a year, but only in ideal storage conditions. The process speeds up when the beans are affected by light, heat, or moisture. So, when the coffee storage method does not protect the beans from these factors, they can lose their freshness and aroma in mere days. 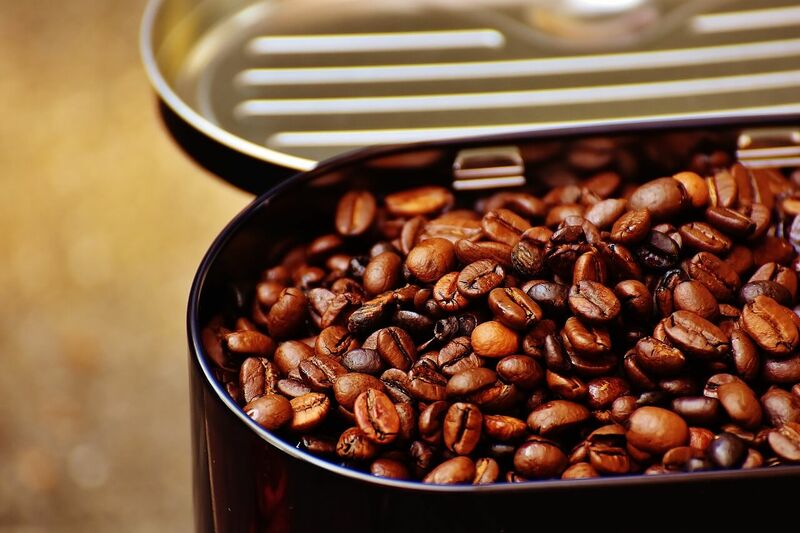 For example, if you keep freshly roasted beans in a proper coffee canister, they will preserve the freshness and their positive properties for around a month. And for an untrained palate, they will taste fresh for an extra month after that. But when your coffee jar allows the air, heat, or moisture in, the beans lose their aroma within the first week. Sometimes even faster. A good coffee container can serve as a shield against the external factors. It can be your little safety vault that preserves the precious aroma of the coffee beans. It is clear now that to enjoy your favorite coffee beverages and their unique flavors, you need fresh beans. Keep the air out. Oxygen can literally ruin your coffee. It makes the flavor cells collapse, causes the evaporation of the precious aromatic oils, and can even create a favorable environment for the microbial life growth. So, you need to protect your beans from oxygen as much as you can. An airtight coffee container would do the trick. Avoid sunlight. UV rays are damaging to many things, including coffee. So, it’s better to store the beans in an opaque canister or in a dark, closed cabinet. Keep it away from the heat. When stored in a warm (or hot) environment, coffee starts to chemically react to it and loses the flavor. That’s why you should keep the coffee canister away from windows, stoves, ovens, radiators, etc. Room temperature is fine, but a cooler pantry area would be even better. Avoid moisture. This external factor is also deadly for coffee. It causes the beans to deteriorate and lose their aroma. Plus, too much moisture creates a friendly environment for bacteria. That’s why coffee needs to be stored in dry places. It’s also a good idea to keep it away from the sink or your cooking surfaces where it’s not much about humidity but some drops of water can reach the beans. Avoid steam. Steam is the combination of both heat and moisture, which means it is deadly for the beans. Therefore, move the beans away from such cooking devices as coffee makers, rice cookers, boilers, kettles, and so on. Don’t buy too much. This is my golden rule, and I advise that you follow it too. The more coffee you buy, the longer it will lie on the shelf. And the more flavor it will lose. So, it’s always better to buy small batches and go fast through them, then buy a fresh batch, and continue. All of this means that the most optimal way to store coffee beans is in an airtight, dark container because such a simple solution can deal with all negative factors – moisture, heat, oxygen, and light – at once. Glass. The main downside of glass is that it’s transparent. This means it will not protect the beans from sunlight. So, if you decide to go for a glass container, it’s best to keep it in a cupboard, away from light. Plastic. Plastic is generally a good choice. But thin plastic containers aren’t that good with keeping the odors away from the beans. It’s better to give your preference to thicker options. Steel. 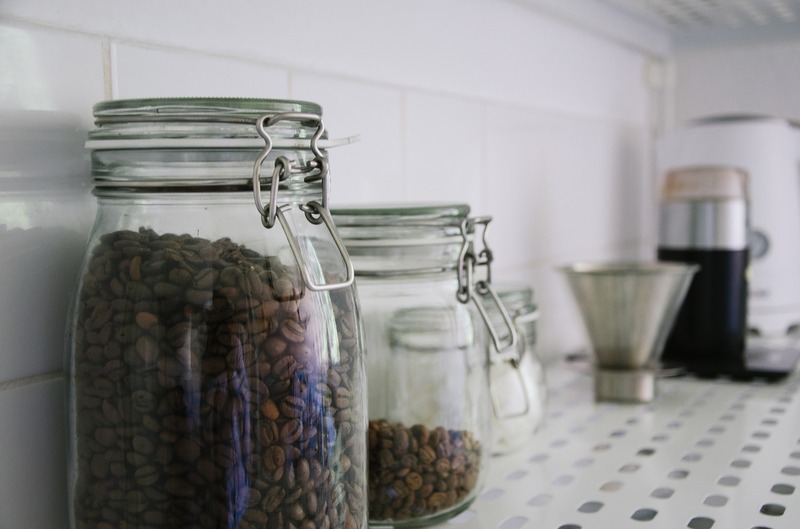 Stainless steel canisters don’t cause a chemical reaction with coffee, which means they are completely suitable for storage. Plus, such containers are great for keeping the light away from the beans. They are very durable too and can serve you for years. Acrylic. These containers are pretty much the same as plastic ones. Their main advantage is affordability. But it’s rather difficult to find a good airtight acrylic jar. Ceramic. Ceramic coffee containers are quite popular because they come in a variety of colors and designs. Not all of them have airtight lids though, so you need to be careful with this type of coffee storage. Ahh, one of the most ancient coffee myths says that keeping the beans in the fridge (or freezer) preserves them fresh longer. #1 – Coffee is hygroscopic, which means it is able to absorb the air around it, including external flavors. Can you imagine how your coffee would taste after residing in the fridge next to such neighbors as, let’s say, cheese, meat, and other foods? Even if your fridge and freezer are sparkling clean, the tiny flavor bits may still linger in there. And the beans will easily absorb them. #2 – Coffee can be killed by moisture. And even if you keep the beans in a dry container, taking them out of the fridge/freezer and then putting them back in will create sudden temperature changes. And they can lead to moisture condensate appearing inside the container. If you still decide to keep the beans in your fridge or freezer, it’s better to store them in small batches. This will help you minimize the temperature changes. Also, make sure you use a vacuum sealed container to avoid unwanted flavors. One of the options you have is buying green coffee and roasting it yourself in small batches. This is probably the best way to get the freshest coffee possible. And don’t worry, you don’t need an expensive roaster. You can use a popcorn maker instead if you have one! Now, let’s say your grinder is broken and you have to buy pre-ground coffee. Or you grind your beans at the local coffee shop. To enjoy fresh coffee, avoid buying and using multiple varieties at the same time. This will only make your beans lay on the shelf longer and lose their flavor and aroma. Instead, try to buy smaller batches. Yes, you will have to do that more often, but you will always have fresh beans. Obviously, you want to keep the coffee fresh, even though it’s already been ground. The rules here are the same as with whole-bean coffee. Avoid air, light, and moisture. But you should also keep in mind that ground coffee loses its freshness faster. In a good storage environment, it will preserve its aroma for around a week. Sturdy construction. This one is obvious: you don’t want a flimsy container with an unreliable lid, but you want something solid and durable. Airtight lid. As you already know, oxygen ruins the coffee flavor. That’s why you need something that would help you create an oxygen-free environment for the beans. CO2 valve. Now, let me explain this one. There’s no proof that CO2 can ruin the flavor of coffee. On the contrary: when the beans degas and emit CO2, it pushes the oxygen away, creating a more favorable storage environment. But when there’s too much CO2, it can create pressure inside the container and compromise its sealing. So, a CO2 valve would be nice to get rid of the excess gas. Date wheel. This nice bonus will help you track the freshness of your coffee. UV protection. Whether it has a solid color or a special coating, a good coffee container should be able to protect the beans from sunlight. 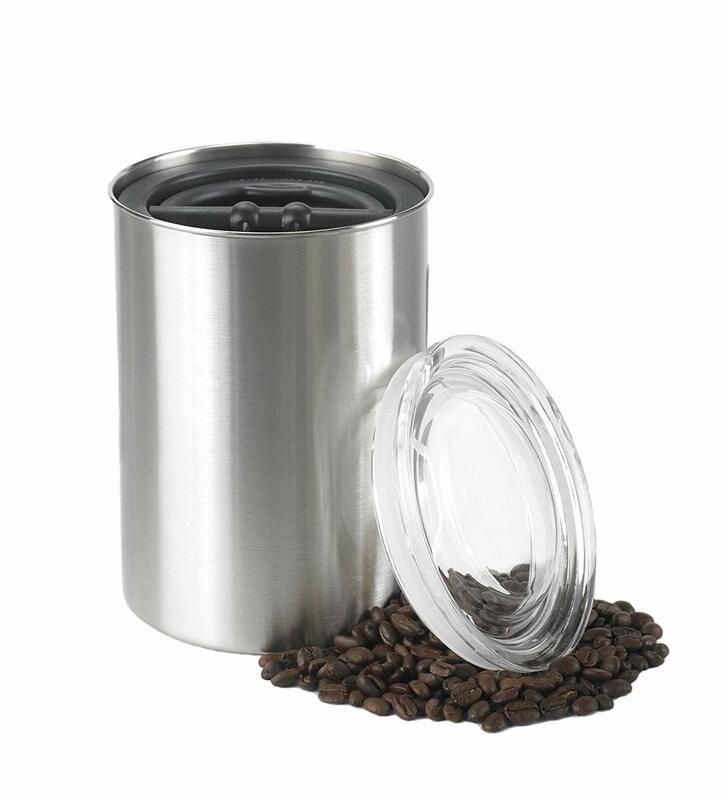 The Coffee Gator tops my list of the best storage containers for coffee because it looks sleek, has a sturdy construction, and works really well to preserve the beans. Now, it has a stainless steel body and an airtight lid that keeps the air away from the beans, so it’s pretty basic. There’s also a special valve that allows the CO2 to vent away. At the same time, it does not let the air in. Such a system ensures the proper sealing of the lid but keeps oxygen out. Note: The body of this coffee canister is pretty light, while the real weight is in the lid, which might cause the canister to fall on its side when the lid is open. Another cool thing about the Coffee Gator is that it is available in 8 different colors and 3 sizes (4, 6, and 7.5 inches tall). It also comes with a scooping spoon, which is a very pleasant bonus. 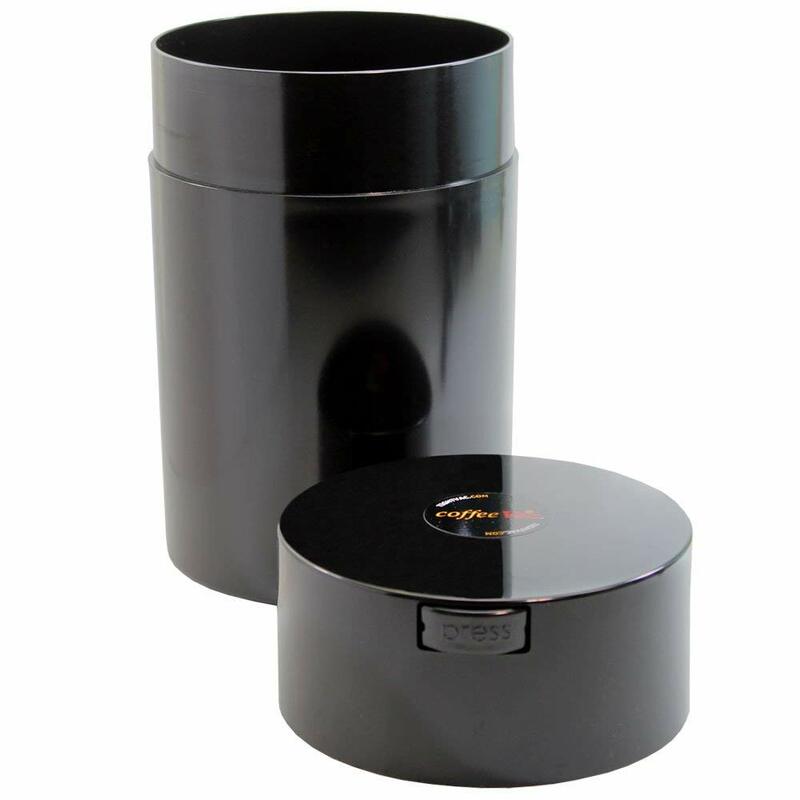 The next product I want to share with you is the famous Airscape coffee canister. And there’s a reason behind its popularity: Airscape really does its job. The way this container works is very simple. You just need to push the special black lid down to get rid of the unwanted air. Then close the container, and voila! The top lid is see-through, so you can always know how much coffee you have left. If the black lid is down near the bottom, it’s time to run to get a fresh batch of coffee. 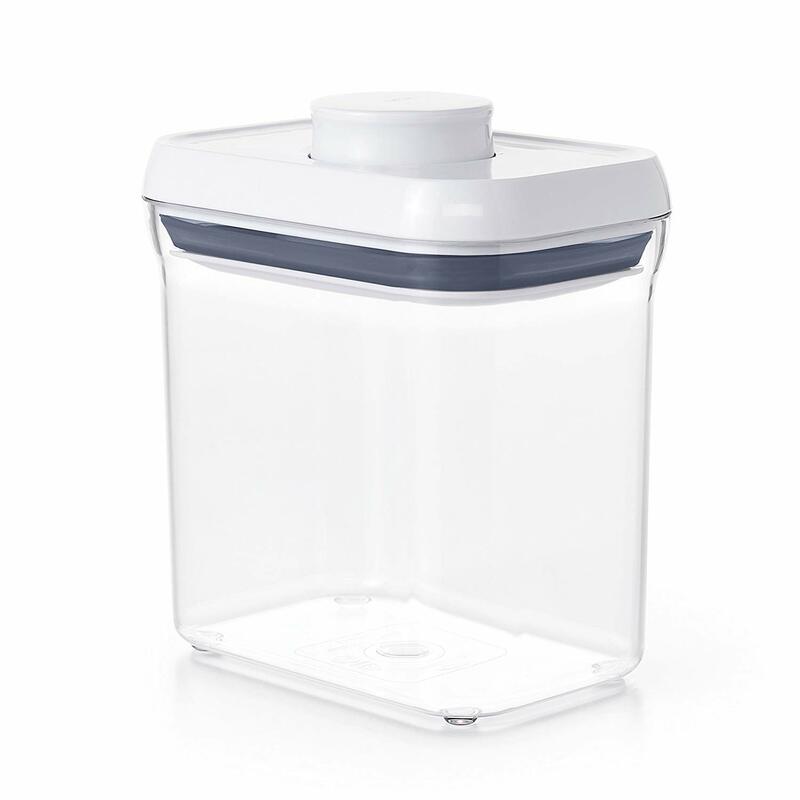 Note: The sizes listed in the Amazon product description and the actual canister capacity are different because the airtight lid takes up quite some space when inside the canister. This coffee storage container comes in 3 size options and 4 colors. Made of sturdy stainless steel, it does have some weight to it and feels rather durable. This is one of those items that combine simplicity, effectiveness, and reliability. Another item on our list of the best coffee storage containers is this simple yet effective little canister. It keeps your coffee fresh by creating an airtight seal. Now, this coffee container is a rather affordable option. It comes in a variety of colors and designs. You can get a see-through one if you want to see how much coffee you have left without using the lid. But make sure you keep it in a dark place. Note: This item is marketed as vacuum-sealed on some websites across the Web, which is not true. It does not pump the air out. The Coffeevac is plastic, which explains its reasonable price. But it has a rather sturdy body, and the plastic is thick enough to keep the external flavors away. If you don’t like the idea of buying smaller batches of coffee, you can benefit from one of the coffee subscription services. The way they work is quite simple: you pick what you like, and the company delivers freshly roasted beans right to your doorstep. You can have a weekly or a monthly subscription depending on how much coffee you usually drink. Another top-rated coffee canister on our list, the Friis seems to be everyone’s favorite, and I understand why. It is very nicely made and does a great job keeping coffee fresh. This container has a sturdy stainless steel body. It comes in 3 colors and 2 sizes. The lid is airtight, which means it keeps oxygen out. However, it has a special valve that allows CO2 to escape. And even though such a construction might seem quite simple, it works to create perfect storage conditions for the coffee beans. Note: This coffee container comes with a replaceable valve, which implies more expenses on the user’s side. As a great bonus, the Friis keeps the light away too. 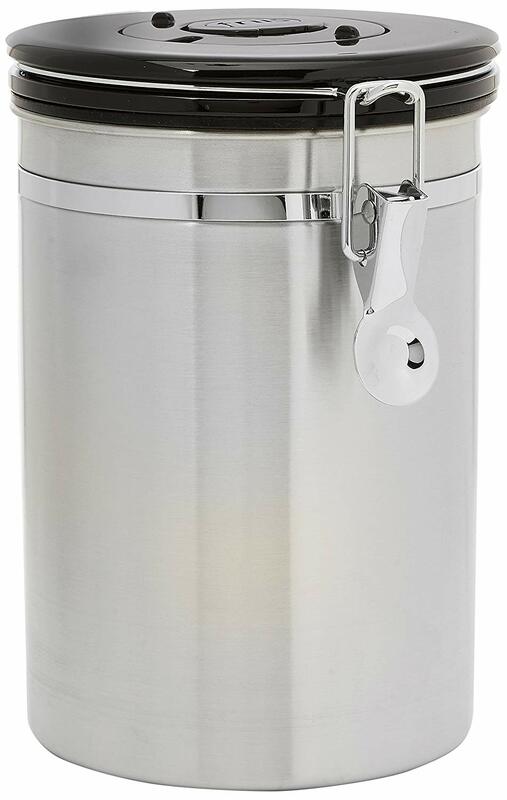 We can easily say that coffee is perfectly safe when being stored in this canister. The last item on our list is one of the most budget-friendly coffee canisters. The OXO is made of clear plastic, so it’s better to keep it in a cupboard. And that’s probably the only little flaw it has. The rest will not disappoint you. There’s a special lid button that seals the container. The lid can be taken apart for easy cleaning. The plastic body is quite thick and doesn’t feel flimsy. Note: Some customer reviews report the item arrived broken, which might be an issue of poor packaging. What makes the OXO stand out from the competitors is the variety of shapes and sizes you can pick from. There are tall, wide, short, square, rectangular containers – whatever you might want. They are stackable and easy to organize in your cupboard. You can pick any shape perfect for your regular amount of coffee. Or even get a few containers. Their price certainly allows for that. Coffee is precious. And it deserves proper storage. Thankfully, we have plenty of options. And I already have my favorites, which I would like to recommend to you. 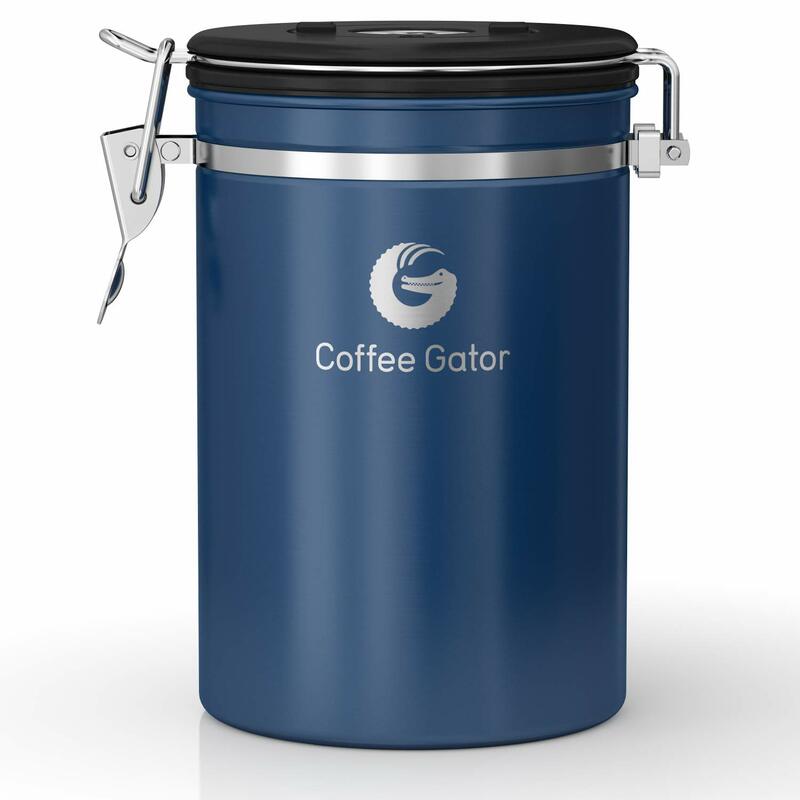 If you don’t have a very tight budget and want something that can withstand years of use, get yourself the Coffee Gator canister. It is very nicely made and keeps coffee perfectly fresh. However, if you are trying to save money, go for the OXO. These coffee containers are cheap and simple but still perform their main function decently. Besides, you can use them for pretty much anything in your kitchen, not just coffee beans. So, how do you keep your coffee fresh? We’d love to discover your own storage tips, so feel free to share in the comments!